Every feature of the breed is important but the overall proportions must come first because only by having the right proportions can the construction be correct. It is possible to have the right proportions and the right construction and still have a dog that does not move correctly but you cannot have a dog that moves as the breed is supposed to move if these elements are not in place. 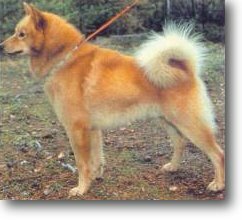 This picture shows a light but strong dog that is pulling slightly on the lead but exhibits all the correct characteristics of the breed and was, in fact, chosen as the breed’s representative dog when Finnish Spitz was formally selected as the national breed of Finland.